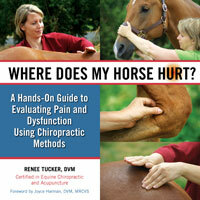 Home > Shop by Category > Natural Therapies > Where Does My Horse Hurt? •Become familiar with your horse's normal range of movement so you can prevent minor issues from becoming major. •Stay in tune with areas of temporary or chronic discomfort so you can offer relief as needed. •Solve "mystery" or "phantom" lamenesses that come and go seemingly without reason. •Save thousands of dollars by avoiding expensive diagnostics that rarely get you answers. •Learn how to discuss potential problem areas with farriers, veterinarians, and bodyworkers. •Keep your horse actively and happily "in work" for more months of the year, and more years of his life.